Here are two photos seemingly ripped out of the scrapbook of the Overlook Hotel's amorous canine monster. These two photos of enthusiastic Disney fans were taken in Serbia sometime in the 1930s. 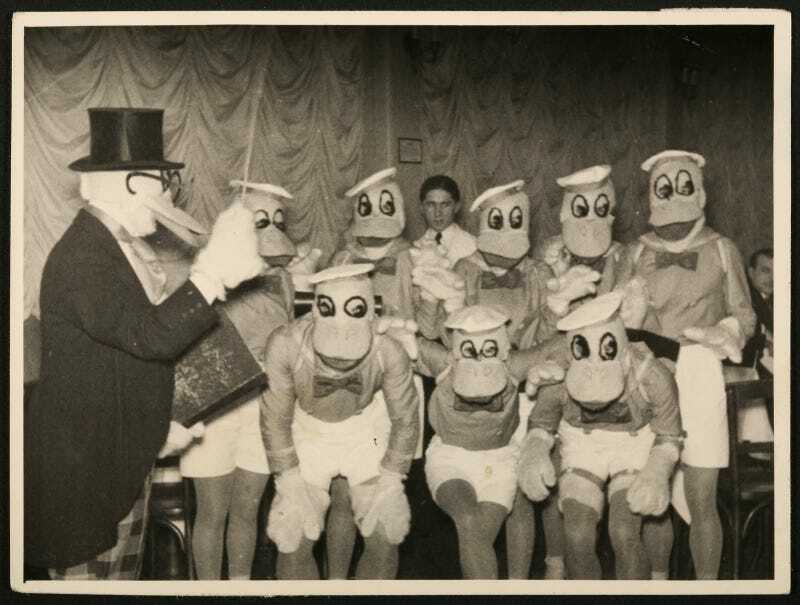 The former depicts a gang of grown men wearing history's most unnerving Donald Duck costumes; the latter is a bunch of Mickey Mouse-faced children playing the cello with some unnamed pig matron. Between this and Walt Disney's old timey depiction of Hell, the early days of Disney were a bizarre time indeed. These photos belong in the Annals of Creepy Disney Tributes, right there with Farfour.